Spline functions are universally recognized as highly effective tools in approximation theory, computer-aided geometric design, image analysis, and numerical analysis. The theory of univariate splines is well known but this text is the first comprehensive treatment of the analogous bivariate theory. 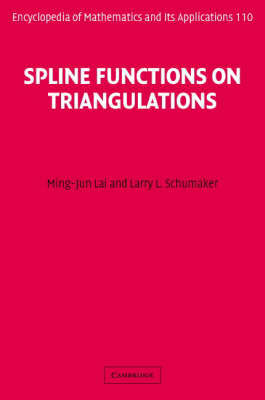 A detailed mathematical treatment of polynomial splines on triangulations is outlined, providing a basis for developing practical methods for using splines in numerous application areas. The detailed treatment of the Bernstein-Bezier representation of polynomials will provide a valuable source for researchers and students in CAGD. Chapters on smooth macro-element spaces will allow engineers and scientists using the FEM method to solve partial differential equations numerically with new tools. Workers in the geosciences will find new tools for approximation and data fitting on the sphere. Ideal as a graduate text in approximation theory, and as a source book for courses in computer-aided geometric design or in finite-element methods.